Private terrace spanning 834 sq. Ft. Residents of this four bedroom duplex penthouse will be welcomed by a light-enhanced, open-plan living space set against the enviable backdrop of the London skyline. Step out onto the terrace – accessible from all rooms on the lower level – via sliding doors for breathtaking vistas of The O2 Arena, Maritime Greenwich and The Shard from 440ft above ground level. The kitchen impresses with its Miele appliances and marble finishes, whilst the dining area showcases a full-height wine cabinet – ideal for those who relish hosting dinner parties. 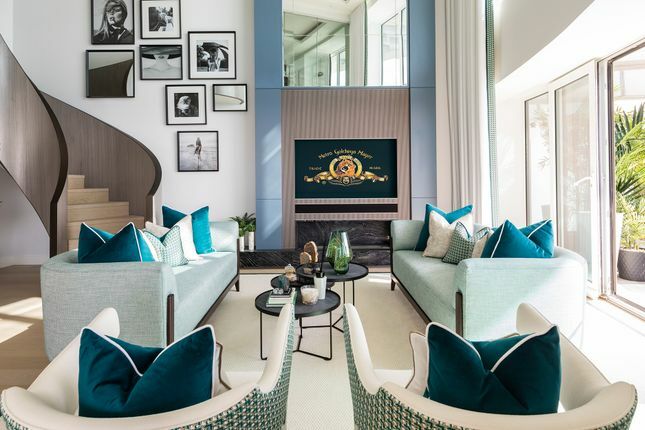 Double-height ceilings enhance the living area’s sense of space, whilst a media unit containing a marble fireplace and 50” LED smart TV cleverly anchors the room whilst drawing the eye. Head upstairs via the striking spiral staircase to find four double bedrooms, including the en-suite master bedroom, as well as a shower room and central bathroom. The master en-suite boasts sleek his-and-her basins and a TileVision LCD TV for an added touch of luxury, whilst all bathrooms feature comfort-inducing underfloor heating. Residents can rest assured that their everyday needs are catered to with Baltimore Tower’s 24-hour concierge, whilst membership to London’s largest residential gym in the adjacent Baltimore Wharf building is incorporated within service charges. This property is available for immediate occupation with one parking space included. Property descriptions and related information displayed on this page, with the exclusion of Running Costs data, are marketing materials provided by Galliard Homes - Baltimore Wharf, and do not constitute property particulars. Please contact Galliard Homes - Baltimore Wharf for full details and further information. The Running Costs data displayed on this page are provided by PrimeLocation to give an indication of potential running costs based on various data sources. PrimeLocation does not warrant or accept any responsibility for the accuracy or completeness of the property descriptions, related information or Running Costs data provided here.